Fresh tomatoes and Potato Gnocchi. You couldn’t ask for a better combination of vegetables to serve to your family and guests. Traditional gnocchi is usually made from potatoes but can be made with ricotta or bread crumbs. They can be homemade, bought frozen or purchased fresh sealed in a vacuum package. They’re a little time consuming to make at home but I’ll give you the recipe for the gnocchi anyway. Personally I usually buy the fresh gnocchi in the vacuum packs to speed things up a bit. The best way to make a tomato sauce is by using fresh tomatoes whenever possible. As I’ve mentioned in previous recipes there is nothing better than fresh vegetables. Organic vine ripened plum tomatoes from your grocer are best to use for this Potato Gnocchi with Fresh Tomato Sauce recipe. Peel the potatoes and place them in a steamer for about 30 to 40 minutes until tender. Do not overcook. 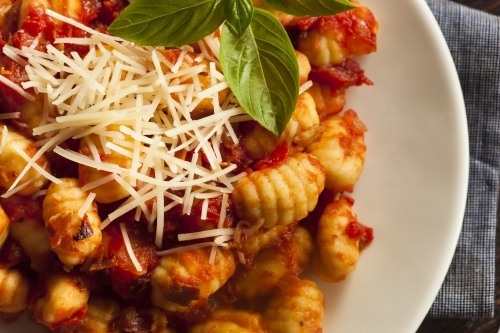 Use a potato ricer or a sieve to get the best results in making the gnocchi. Add salt to the flour. Add some flour to the potatoes to absorb the water . Turn the potatoes out on a floured board and use your hands to mix in the remaining flour. Knead in the flour and potatoes until it forms a firm dough. If you don’t add enough flour the gnocchi will fall apart when cooking so the consistency must be correct. Form some of the dough into a ball and roll into a long rope. Cut into one inch pieces and press lightly with a fork. Place the potato gnocchi in 6 quarts of salted boiling water until the gnocchi floats to the top. Remove the potato gnocchi with a slotted spoon. This should take about two minutes. First prepare the tomatoes by cutting off the tops and submerging them in boiling water for around 2 minutes. Remove the tomatoes from the water and place them in a bowl of ice water. Peel the skin off the tomatoes, slice in half and scope out the seeds. In a large sauce pan sauté the onions and garlic in the olive oil for 2 minutes. Stir in the tomato paste and cook for 3 minutes being careful not to burn the paste. Stir in the tomatoes, red wine, basil, oregano and sugar and simmer for 30 minutes. Plate the Potato Gnocchi on a large serving platter and cover with the tomato sauce. Serves 4 to 6 people.